Download a blank fillable Dd Form 2852 - Patient Movement Event/near Miss Report in PDF format just by clicking the "DOWNLOAD PDF" button. Complete Dd Form 2852 - Patient Movement Event/near Miss Report with your personal data - all interactive fields are highlighted in places where you should type, access drop-down lists or select multiple-choice options. (Information placed on this form is confidential and privileged in accordance with 10 U.S.C. 1102.
accordance with DoD 5400.11-R (the DoD Privacy Program). 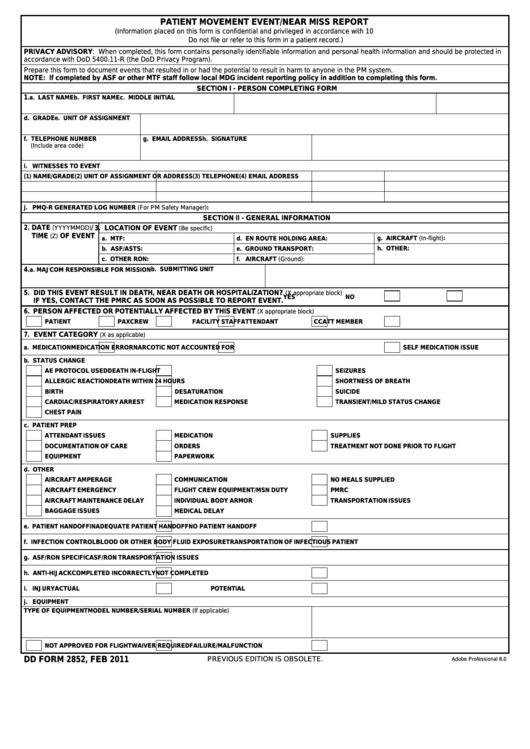 Prepare this form to document events that resulted in or had the potential to result in harm to anyone in the PM system. NOTE: If completed by ASF or other MTF staff follow local MDG incident reporting policy in addition to completing this form. 5. DID THIS EVENT RESULT IN DEATH, NEAR DEATH OR HOSPITALIZATION? IF YES, CONTACT THE PMRC AS SOON AS POSSIBLE TO REPORT EVENT.